Looking to rent an adjustable fork attachment for the Toro Dingo in Rochester NY, Ithaca NY and Western New York? 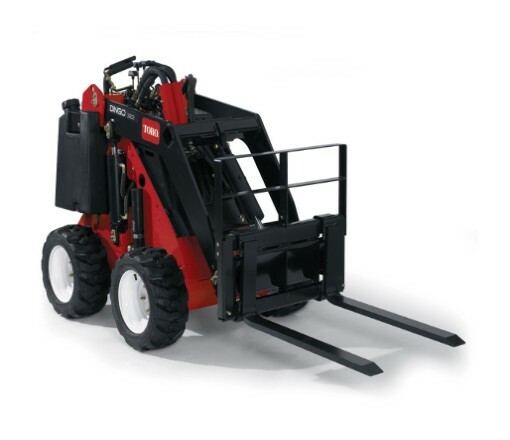 The Duke Company proudly carries a comprehensive range of rental attachments and tool rental items for the highly versatile, productive and powerful Toro Dingo. With an A+ reputation for prompt delivery and convenient pick-up, the Duke’s team of rental experts would be glad to assist you with tool rental and heavy equipment rental items from the industry’s leading manufacturers. The Adjustable Fork Attachment is a widely respected Tool Rental item by landscaping professionals. Powerful and durable for steel forks. Widely respected for material handling tasks such as moving rocks, trees, pallets and posts around the job site in compact situations. Operating Capacity = 335 pounds.